“Kameido, with its Shrine and Wistaria Garden, in Honjo-ku, in a tawdry neighborhood near the NE outskirts of the city, should be visited in late April or early May as the wistaria usually begin to droop about the end of the first week in May. The narrow thoroughfare leading to the entrance terminates in a handsomely carved gateway in the natural wood adorned with shishi, fishes, birds, dragons, and wave patterns. “Just within the inclosure [sic] is a locally celebrated Drum Bridge (Taiko bashi), a time-worn structure over whose high hump devotees climb (risky with high-heeled shoes) as an act of special devotion to the divinity to whom the shrine is consecrated. From the wiki: “The Tenjin shrine network enshrines 9th-century scholar Sugawara no Michizane. Sugawara had originally been enshrined to placate his spirit, not to be worshiped. He had been unjustly been exiled in his life, and it was therefore necessary to somehow placate his rage, believed to be the cause of a plague and other disasters. 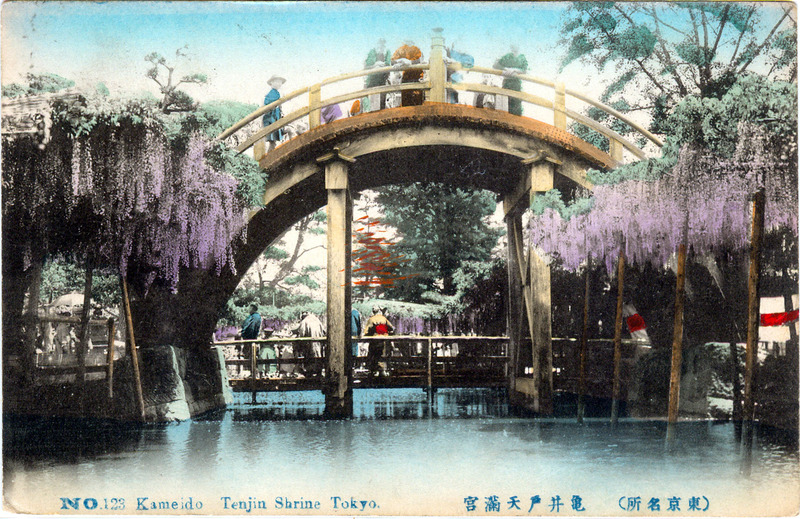 “Tokyo’s Kameido Tenjin Shrine is perhaps most well-known for two things: its famous arched ‘drum bridge’ and the purple wisteria which overhang much of its ponds from overhead trellises. The spacious grounds of Kameido Shrine are dedicated to the 9th century scholar, poet, and politician named Sugawara no Michizane.